Reminder: As a reminder, our donor board minimum will increase to $7.99 tomorrow (March 1st). – The Opening | Houston: We had a few guys out at the Houston Opening on Sunday. Here a few quick-hitters on some of the OU targets that were there. Austin Stogner was the best tight end out there. There were some other D1 guys out there but anyone who was as big as Stogner couldn’t sink their hips and get out of their break like he can, and anyone who could do what Stogner did in that regard wasn’t nearly as big as he is. He has great hands as well, especially considering it was a rainy day. Another thing I noted about Stogner is how much fun he has on the field. There is just a genuine joy about him when he’s playing. You can tell he loves being out there. Marcus Stripling is a man with some quick hands and a quick first step. He’s a hard man to block. Stripling will be a problem at the next level, especially in third down situations. *Recruiting: Green’s father said they may make a return trip to LSU next weekend. OU is somewhere in their top five. I did ask Green’s father if a decision is going to come quick and he said they really aren’t sure right now. I think there are a few more visits they’d like to take but expect them to narrow things down fairly soon. *Recruiting: Ceaser is the young man Brandon mentioned whose father was committed to OU in high school but ended up going to the military. Sadly, Ceaser’s father is no longer with us. The OU offer was a special thing for Ceaser. He visited for the first jr day. *Recruiting: Texas and Texas A&M are leading the way here. However, he did note that he wants to visit OU during the spring. *Recruiting: So, Jamal was actually wearing Texas gloves and when our camera man went up and get a shot of him he threw the horns up. You have to take those things with a grain salt. There is no question the Sooners are high on his list. He’s already announced that he will take a return visit to Oklahoma for the spring game. If Oklahoma continues to push for Morris, I think there’s a good chance he ends up there. I also get the sense from him that he’s looking to make a spring decision. To be completely honest I didn’t watch Arjei Henderson a ton. The overall comments from our guys was that he’s the most polished guy out there but beyond that I wouldn’t have anything substantive to add since I didn’t watch him much. 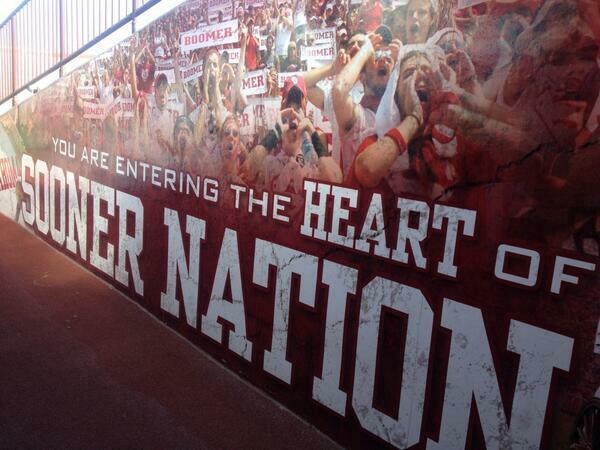 *Recruiting: In terms of recruiting…OU is in a good spot. He will be in Norman for the OU spring game. – Jalani Williams: The Sooners hosted 2019 DB, Jalani Williams (St. Louis, MO) for the most recent jr day. After the visit, I spoke with Williams over the phone. Jalani seemed to like the comfort level he has with the staff, “I like the vibe. I like coach Cooks’ vibe a lot; the way coach Cooks and coach Riley are as people outside of football. The facilities are nice and the campus is nice but really I like the people there”. Williams made his level of interest in OU clear, adding “OU is up there for me…I’m going to take an official visit there”. That is no small thing since Williams has already been on numerous unofficial visits which include trips to Alabama, UGA, Missouri, Arkansas, Nebraska, Notre Dame and Illinois. Williams declaring his intention to use one of his five official visits on Oklahoma is a reason to be optimistic. – Theo Wease and Arjei Henderson were both committed to the Sooners at one time. It’s a been while since they decommitted and both have visited a lot of campuses. Rumors have swirled about a number of schools being their favorites, since then. Wease and Henderson are expected to take return trips to Oklahoma for the spring game. The word we are hearing is that the Sooners are in prime position with the pair. Both are expected to make spring time decisions. We are already hearing positive reports about skill guys like Jaquayln Crawford. We all saw what CeeDee Lamb did as a freshmen and the Sooners are bringing in elite wide receivers that can win one-on-one match ups. If the trend for Wease and Henderson continues to move in the Sooners direction, the Sooners are going to be putting every defense they face in a pick your poison situation. Kayvon Thibodeaux (Los Angeles, CA)) is the most highly coveted 2019 defensive end in the country. He recently dropped his top twelve and the Sooners made the cut. I have spoken to Thibodeaux’s mother, Shawnta, at length. We talked about Kayvon as a young man and how they’re going to handle the recruiting process. There are a lot of people that say academics and character come first, I get the very real sense that Kayvon’s mother means it, “I raised him to be a man of God. School always come first. He’s intelligent. He’s self motivated. We get great feedback about him from teachers and other parents. That let’s me know I’m doing my job”. As Shawnta sees it, her job is pretty clear, “my job is to make sure he stays focused and humble. If your grades aren’t up to par, you aren’t playing. I don’t care what he’s ranked”. In terms of recruiting and visits, when I spoke to Shawnta the family was still deciding on where to take visits and when they’d like to take them, “Kayvon wants to visit a lot of schools but we’re going to narrow things down and have a plan on what schools we’re going to visit”. So far, he has visited his area schools like USC and UCLA. He also took a trip to LSU early in his recruiting process, but really hasn’t ventured out much beyond that. They do plan on taking all five of their official visits and Kayvon’s mother says that Oklahoma is certainly a school which is in consideration for a visit, whether that be officially or unofficially. Oklahoma has been targeting more and more elite prospects since Riley took the reigns and they’re winning more and more battles. With a recruitment of a prospect like Kayvon, you have to chop wood. You have to make that top ten, which the Sooners did. Then you have to get the player on campus and take it from there. – I know the loss of 2019 NG, Derek Green probably still stings a bit. However, it’s very much worth noting that the nose guard position is probably one of the positions where the Sooners could afford to take a bit of a hit in this cycle. They took two very large human beings as nose guards in the 2018 class (Kelley and Thompson).